The Military Freefall Parachutist Badge is a military badge of the United States Army and United States Air Force awarded to qualified U.S. Army and U.S. Air Force personnel as high-altitude military parachute specialists. To earn the Military Freefall Parachutist Badge, the military member first must receive all necessary ground training, already have earned the Military Parachutist Badge (jump-qualified), and must have completed the requisite freefall (night, combat equipment, oxygen) jumps and graduate from the Military Free-Fall Parachutist Course. A star and laurel wreath, centered above the badge, called the Master Military Freefall Parachutist Badge, is authorized for U.S. Army Soldiers and U.S. Air Force Airman qualified as a Master Military Freefall Parachutist (Jumpmaster). Such qualification requires completing the Military Free-Fall Jumpmaster Course, wherein the student learns how to be a jumpmaster in military freefall operations. The Military Freefall Badge original design was submitted in March 1983 by Sergeant First Class Gregory A. Dailey of SFODA-552, Company B, 2nd Battalion, 5th Special Forces Group. Updates on the design, adding a Master Military Freefall Parachutist Badge were submitted by General Wayne A. Downing of U.S. Special Operations Command (USSOCOM) and James Phillips of the Special Forces Association. The badge was approved for wear by U.S. Army Soldiers assigned to U.S. Army Special Operations Command (USASOC) on 1 October 1994. Unrestricted wear was approved on 7 July 1997 by General Dennis Reimer. The parachute is a seven-celled MT1-X, the first ram-air parachute to be adopted by the U.S. Military as the standard freefall canopy. 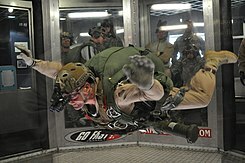 The U.S. Military Free-Fall School (MFFS) is operated by the USASOC's John F. Kennedy Special Warfare Center and School, 1st Special Warfare Training Group (Airborne), 2nd Battalion, Company B at the U.S. Army's Yuma Proving Ground (YPG) in Arizona, which is the USSOCOM proponent for military freefall. The MFFS conducts three primary training courses, the Military Free-Fall Parachutist Course, the Military Free-Fall Jumpmaster Course, and the Military Free-Fall Advanced Tactical Infiltration Course. The U.S. Air Force also conducts the Military Free-Fall Jumpmaster Course—certified by the MFFS—at Davis–Monthan Air Force Base for airman that are not able to attend the MFFS's jumpmaster course. Alternatively, detachments from the MFFS conduct the Military Free-Fall Jumpmaster Course via mobile training teams (MTT) for military freefall units that have difficulty attending the course at the Yuma Proving Ground. Upon graduation of the MFFPC, students are awarded the Military Freefall Parachutist Badge. Upon graduation of the MFFMJC, students are awarded the Master Military Freefall Parachutist Badge. Upon graduation of the MFFATIC, students are presented a certificate of completion; there is no badge or badge device awarded for completion of the MFFATIC. ^ a b c d "Military Free Fall Parachute Badge". Army Quartermaster Museum. United States Army. Retrieved 2008-11-22. ^ Talley, LCpl Jordan (21 April 2017). "First Ever Military Freefall Jumpmaster Course Hosted Overseas". dvids. Camp Courtney. Retrieved 21 May 2017.